Be You, but Be Careful. 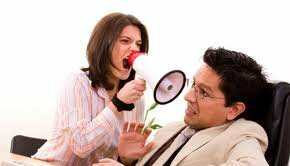 Until we comprehend that others react to their perceptions of what we say or do and not to our intentions, we may continue to experience negative responses to our well-intended, natural behaviors. We may, in fact, see others as “overreacting” or “missing the point.” If we find that others, not only, don’t seem to understand us, but also, often take offense, we may have some fine tuning to do on how we present ourselves. If you’re strongly goal driven, you may be seen as cold and uncaring. Gentle people may avoid you. Work at softening your style. If absolute perfection drives you, you could be perceived as inflexible and stubborn. Lighthearted folks may write you off as a micro-manager. Focus more on outcomes and less on the methods used to get there. So you’re usually bubbly and outgoing? Detail oriented people may see you as lacking focus and not being dependable. Work on prioritizing your day to assure that you’ll be seen as someone who can be counted on to meet deadlines. As a very gentle and caring person you’re compassionate, but run the risk of being viewed as unmotivated and even lazy. You may be seen by the task-oriented people as someone who wastes too much time with people and can’t be counted on to get the job done. Make accomplishing your tasks your first priority and then reward yourself with people-caring time. So BE YOU, but BE CAREFUL to compensate for the possible misconceptions of others or you may find others misreading you and “overreacting” to your natural behavior. The perceptions of others is their reality and they’ll behave based on their interpretations of your actions and not on your intentions.. When You’re Wrong to be Right!